Manaslu 8,156 metres (26,759 ft) ranked 8 th among the eight-thousanders is also known as Kutang, located in the Mansiri Himal, part of the Nepalese Himalayas. Manaslu is derived from the Sanskrit word Manasa and is translated as "Mountain of the Spirit". Manaslu is the highest peak in the Gorkha district and is located about forty miles east of Annapurna , the tenth highest mountain. The mountain's long ridges and valley glaciers offer feasible approaches from all directions, and culminate in a peak that towers steeply above its surrounding landscape, and is a dominant feature when viewed from afar. Manaslu was first climbed on May 9 , 1956 by Toshio Imanishi and Gyalzen Norbu , members of a Japanese expedition. The Manaslu region comprises from sub-tropical foothills of the Himalaya to arid Trans-Himalayan high pastures bordering Tibet. The famous trekking route goes around Manaslu massif over the pass down to Annapurna. The trekking trail follows the classic salt-trading route along the Budhi Gandaki river. The branching off of the river at Chhikur divide two domains. While Nubri has been frequently visited after Nepal opened itself for the tourists in 1950, Tsum, still retains its time honored culture, art and tradition. The region is dotted with austere monasteries, maniwalls, chortens and other Buddhist religious landmarks. The faith of non-violence and compassion has augmented wild-life diversity of the region. Unlike many other regions, this valley is a sanctuary to highly endangered animals including Snow Leopard and Pandas. 110 species of birds, 33 mammals, 11 butterflies and 3 reptiles are recorded so far. The valley basin is rich with nineteen different types of forests, most prominently Rhododendron, and also Himalayan blue pine, which is flanked by Ganesh Himal and Sringi ranges. 10 other peaks over 6500 m. are visible during the trek including the famed ones over 7000 m. The Tsum, which was restricted for tourists for long time, is now the center of attraction for intrepid trekkers in the region with the government of Nepal recently opening it for group tourists. 1950 H.W. Tilman made a reconnaissance of Manaslu and believed there was a potential route to the top via the northeast. 1952 Japanese reconnaissance party reached 5275 m/17,300' on the east side. 1953 First attempt made by a Japanese team of 15 climbers to summit via the Northeast face. 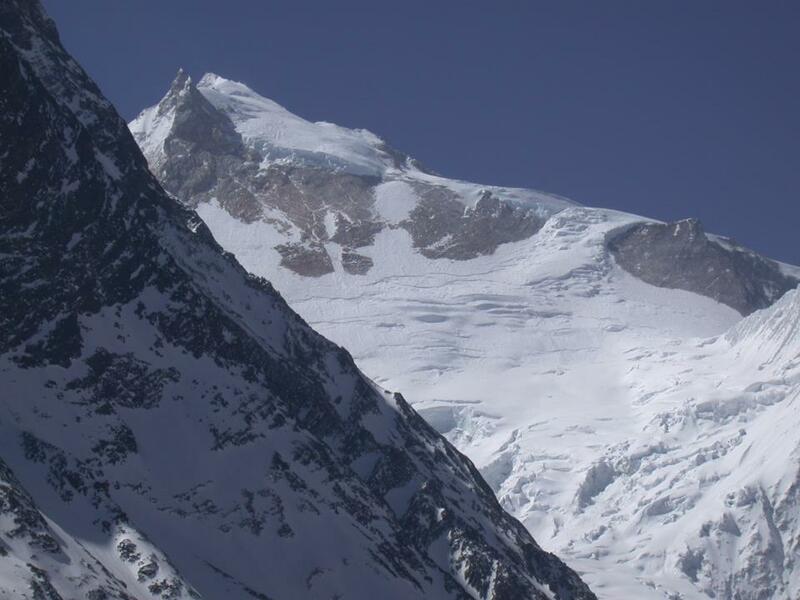 Three climbers made a summit attempt reaching 7750 m/25,425' before turning back. 1956 First ascent , by T. Imanishi (Japan) and Gyalzen Norbu (Sherpa). 1971 On May 17 , Kazuharu Kohara and Motoki, part of an 11 man Japanese team, reached the summit via the NW spur. 1971 Kim Ho-Sup led a Korean expedition attempt via the Northeast. Kim Ki-Sup fell to his death on May 4 . 1972 An Austrian expedition led by Wolfgang Nairz made the first ascent via the SW face. 1972 Koreans attempt the Northeast Face route. On April 10 , an avalanche buried their camp at 6,500 m (21,300 ft), killing 15 climbers including 10 Sherpas , the Korean expedition leader Kim Ho-sup,  and Kazunari Yasuhisa from Japan. 1973 On April 22 , Gerhard Schmatz, Gerhard, Sigi Hupfauer and a Sherpa climber reached the summit via the Northeast face. 1974 On May 4 , an all female Japanese expedition makes the summit, becoming the first women to climb an 8,000 metre peak. One climber died on May 5 when she fell between camps 4 and 5. 1975 On April 26 , Gerald Garcia, Jeronimo Lopez and Sonam Sherpa of a Spanish expedition summit via the Northeast face. 1993 On May 2, Sepp Brunner, Gerhard Floßmann, Sepp Hinding and Dr. Michael Leuprecht reached the summit via the normal route and descended with ski from 7,000m to the basecamp. The Austrian expedition was guided by Arthur Haid. 1997 Charlie Mace makes the first American ascent. 2002 On May 13, five Americans and two Sherpas reach the summit. See the 2002 American Manaslu Expedition . 2006 On May 29, Australian mountaineer Sue Fear died after falling into a crevasse on her descent after summitting. She was a friend of mountaineer Lincoln Hall, who survived a night exposed near Everest's summit. 5 Nights accommodation in Kathmandu with bed & Breakfast. Drive Kathmandu - Aru Ghat - Kathamndu by bus. Garbage deposit USD 3000.00 per team & after expedition will be refundable.